“We must come to see that the end we seek is a society at peace with itself, a society that can live with its conscience. And that will be a day not of the white man, not of the black man. That will be the day of man as man. The freedom march from Selma to Montgomery, Alabama in the cause of African-American voting rights was pivotal to the passage of the 1965 Voting Rights Act. The Selma demonstrations and marches totaled 18 days. Begun on March 7, 1965, the first march was led by Congressman John Lewis, then head of SNCC (Student Nonviolent Coordinating Committee). When the initial group of approximately 600 marchers reached the Edmund Pettus Bridge and crossed into Dallas County, the were met by state troopers who proceeded to beat them back ost brutally. That first “Bloody Sunday” was the beginning of other horrific confrontations leading to the death of civil rights activist James Reeb. The third march, led by Dr. Martin Luther King, began on March 21st and culminated on the steps of the State Capital Building in Montgomery, Alabama on March 25th, 1965. The following is a rarely shown documentary of the Selma to Montgomery March in 1965. It is stark and brief and filled with sights, sounds and music. Martin Luther King, Jr.’s last work was to support the sanitation workers on strike in Memphis, Tennessee. The following is an excerpt from a documentary on their story and excerps from King’s speeches in support of their efforts. The following is a rarely heard speech from August 1967. 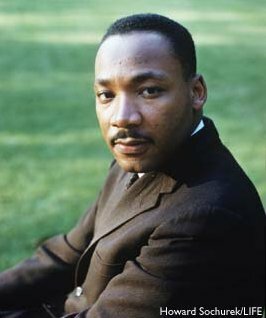 Dr. King spoke about the historical ramifications of slavery and inequality–with the strong belief that there was still so much work to do and unwincingly put himself on the line as a leader who would never stand down from what he felt was necessary to do. He gave the speech at the National Association of TV and Radio Announcers convention. In fact, violence merely increases hate….